Ivanovic d. Strycova in 2 sets – On paper this is a good match-up for Ana. Concerns would be tiredness and it seems too obvious with the 3-0 H2H and how this week has been going! Petkovic d. Garcia in 3 sets – I couldn’t help but laugh that Garcia beat CSN in one of the few matches I didn’t have faith in her! Surprised also by Petko’s straightforward win over JJ although the H2H has always favoured Petko. Back at the US Open, a rusty Petko scrapped her way to a three set win over Garcia. Petko is playing much better this year so I think she takes this one. Svitolina d. Vandeweghe in 3 sets – CoCo was solid against a listless, Pliskova and then rallied from behind against Mlads. I wasn’t that impressed by Svitolina in her match against Muguruza, despite the win. It’s another classic big hitter vs. counter puncher… quite simple really, if CoCo serves well, and keeps it reasonably solid then she wins, but otherwise Svitolina’s consistency will prevail. This is the one i’m most tempted to go for the underdog. Suárez Navarro d. Garcia in 2 sets – I’ve gone for CarGar in so many of these matches. While she stands a chance if she keeps it steady (hmmm), CSN will get a lot of balls back and likely frustrate the Frenchwoman. Conditions could work in her favour but going for CSN who has been very reliable so far this year. Kvitova d. Brengle in 3 sets – This match terrifies me haha! Brengle soaked up all the pressure against Makarova and forced her into a huge tally of unforced errors. 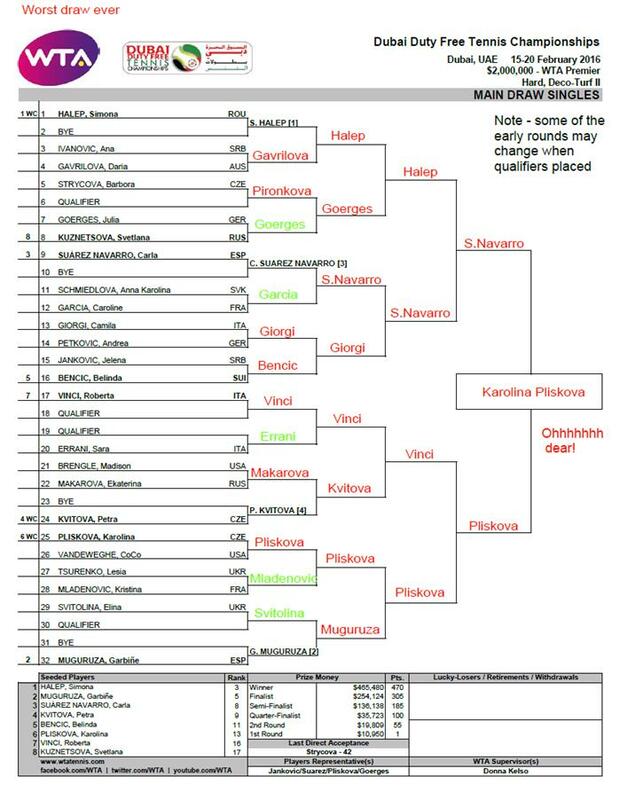 Same could happen here but I am going to have faith in the Petra! Muguruza d. Svitolina in 2 sets – Looking forward to watching this one. Mugs has won their two previous matches in straight sets and it could be the classic case of where Svitolina struggles against a more aggressive opponent. Intrigued to see Svitolina play after her recently teaming up with Henin and also Muguruza, to see where she is at. Shvedova d. Errani in 3 sets – Last time they played was the golden set! Errani recovered from a huge first set deficit against Saisai Zheng but i’m still not convinced and it sounds like she is struggling with confidence. Could be a nervy affair, would give Shvedova the edge. Vandeweghe d. Mladenovic in 3 sets – Complete toss-up, brain said CoCo so I wrote CoCo. Jankovic d. Petkovic in 3 sets – Again on the fence, JJ might be tired but i’m leaning towards her in this match, despite Petko leading the H2H. Svitolina d. Cepelova in 3 sets – This will be Svitolina’s first match since the Aus Open so I wouldn’t be surprised if she makes a slow start or generally has a struggle against Cepelova who has started the year well and has confidence from coming through three rounds of qualifying. Vinci d. Shvedova in 3 sets – Shvedova is an awesome ball hitter and will likely give Vinci a tough workout. I’d stick with Vinci but if she’s feeling fatigued, Shvedova is good enough to win, assuming she can power through the nerves. Pironkova d. Strycova in 2 sets – Pironkova has a good record against Strycova and as i’ve said before, I do like qualifiers in these matches as they have plenty of match play on the surface. Errani d. S.Zheng in 3 sets – Oh boy this could be fun… and long! Errani did win their last match for the loss of just one game but their first encounter in Shenzhen was decided by a third set tiebreak. Errani’s had a poor start to the year and Zheng will be buoyant after defeating the Lepchenko, the number one seed in qualifying. Still going for Sara though. Makarova d. Brengle in 2 sets – Makarova had a surprising loss in Fed Cup action last week but i’d still fancy her to win this one reasonably comfortably. Giorgi d. Petkovic in 3 sets – 50/50 match and really could go either way. Heart says Petko, head says Giorgi! Goerges d. Kuznetsova in 3 sets – Just a feeling and will be brave with this one. This makes little sense based on the head-to-head with Sveta leading, 4-1. However, Goerges has a new team this year, is a former finalist in Dubai and had a super first week of the year in Auckland where she reached the final. Pliskova d. Vandeweghe in 2 sets – Dangerous match for Pliskova despite Vandeweghe yet to win a singles match this year. Vandeweghe won their last match at Wimbledon last year. I think Pliskova will edge it in two tight sets. Mladenovic d. Tsurenko in 2 sets – Both have made somewhat shaky starts to the year. Tsurenko leads the H2H, 3-0, but i’m favouring Mlads. Garcia d. Schmiedlova in 2 sets – Schmieds is having a rough year so far. Based on the form book, CarGar is the clear favourite… it doesn’t always go like that but still feel Garcia is most likely to prevail.